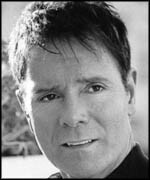 Cliff Richard, the singer who just won't give up and go away, is to release a Greatest Hits of Greatest Hits album early in the new year. Cliff, real name Harry Webb, is now 78, and has, so far, released 124 studio albums since his emergence onto the world stage in 1951. Of these, eight have been seminal 'Greatest Hits' albums. This brand new release is cleverly entitled 'Cliff's Greatest Greatest Hits', and will feature selections from those previous 'Greatest Hits' releases. Bonus tracks appear in the form of those recorded during his now infamous impromptu 1996 Wimbledon performance, when he annoyed tennis spectators during a rainbreak with renditions of 'Summer Holiday', 'Singin' In The Rain', ‘Bachelor Boy’, ‘Livin’ Doll’, and 'Congratulations', for which he received a lifetime ban from the SW19 authorities.